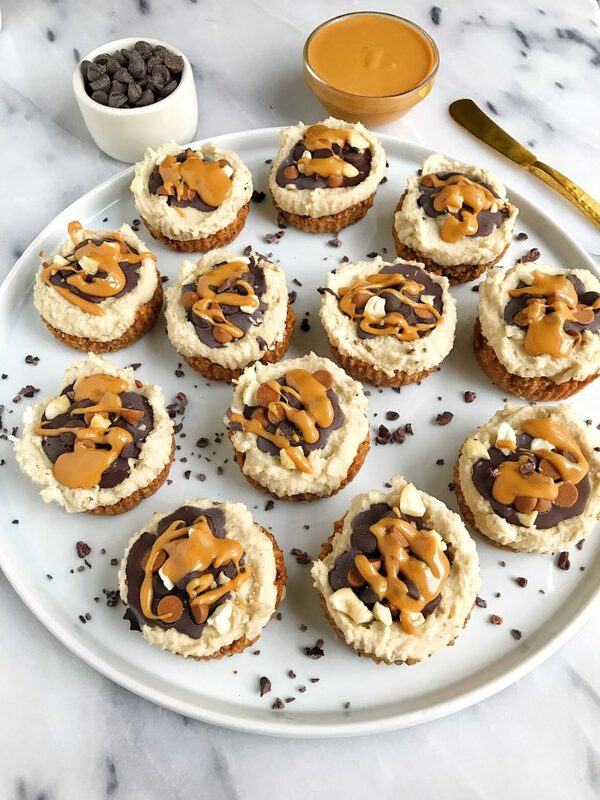 Vegan Cashew Cream Cheesecakes that are gluten-free and grain-free for an easy healthy cheesecake recipe! I don’t think it is possible to love a dessert more than I love these Vegan Cashew Cream Cheesecakes. OH MY GOSH you guys! They are a dream. I have made a few different vegan cheesecakes here on the blog and each time I put a new spin on the recipe and fall in love all over again with these. I love that I can eat cheesecake that isn’t filled with cheese or even tofu for that matter. I notice that a lot of cheesecakes online that are vegan use tofu in place of the “cheese”. While that is a very good idea, I personally do not eat tofu (it bothers my stomach!). I love using soaked nuts in place of it. Cashews are by far my favorite right now to make cheesecakes out of and this Cashew Cream Cheesecake is on top of an easy date and almond crust (no butter!). The cheesecake filling is made up of only four ingredients. I use raw cashews, coconut milk (full fat), vanilla extract and Nutiva’s Coconut Oil with Butter Flavor to get that delicious butter-y flavor in the cakes. At first I was a bit apprehensive on this buttery coconut oil but now I am obsessed! It is not only amazing on top of popcorn or spread on toast, but it is a game changer to bake with. Plus you can even find it at Walmart! For anyone who has an intolerance to butter (I don’t but love using new products!) it adds that flavor you miss from real butter to the recipe. 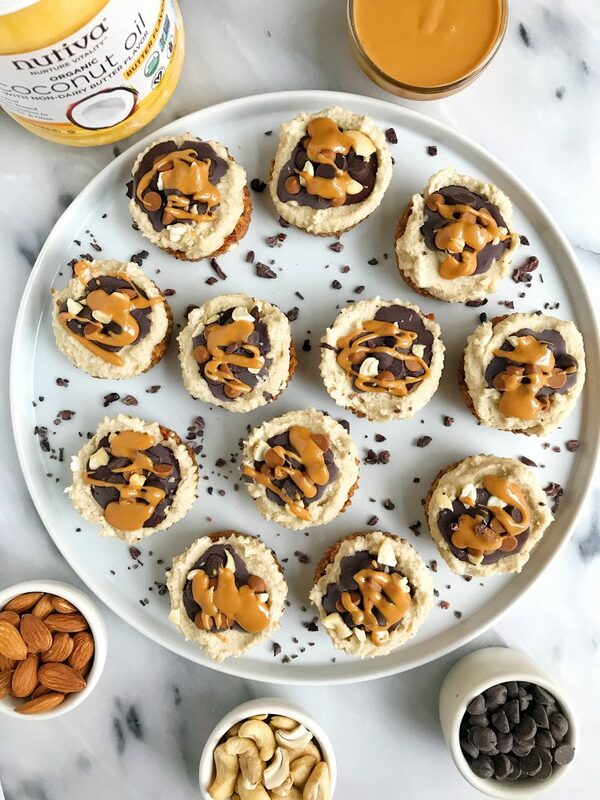 Nutiva’s vegan butter flavor is made from pure organic and non-GMO plants like sunflower, coconut and mint. They are never processed with any chemicals either! I use a variety of their other products too like Organic Coconut Sugar, Organic Mct Oil and more. They have so many amazing ingredients for cooking and baking, it’s amazing. I have a few more Nutiva recipes coming up next year too that I cannot wait to share. For these Vegan Cashew Cream Cheesecakes, you can really top them with anything you’d like. 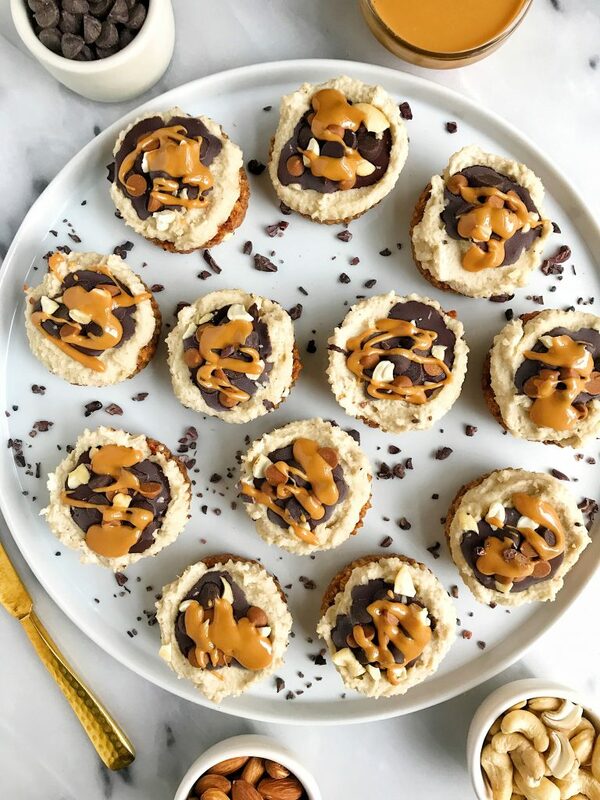 Some crushed nuts, chocolate drizzle or even some cashew butter on top. 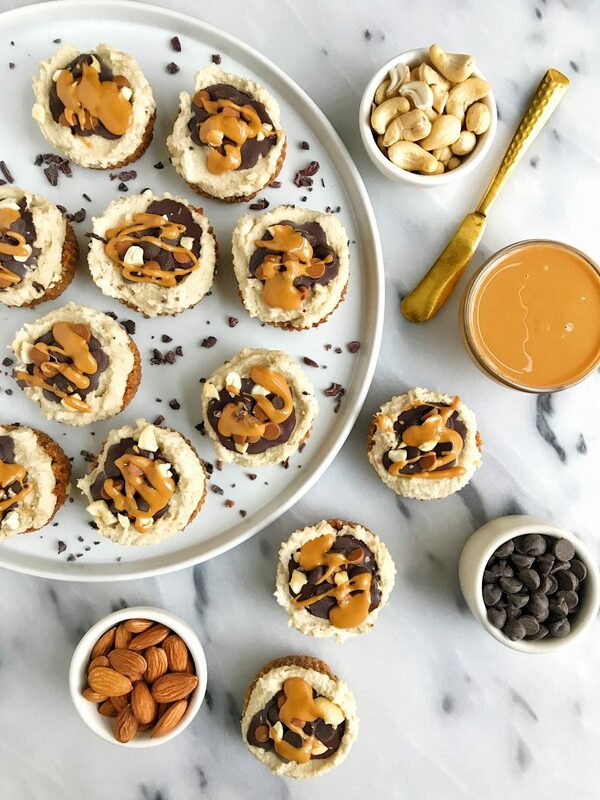 The possibilities are endless and they are the perfect gluten-free and vegan dessert to bring to a holiday party. Plus there is no refined sugar in them! *Will stay good in freezer for about a month or so, let them thaw out for a couple of minutes before eating! Thank you Nutiva for sponsoring this post. It means so much to me to work with brands that I love and who support rachLmansfield! These are to die for! I love that they’re not overly sweet, and that the cashews add a natural sweetness. The perfect Whole30, guilt-free treat! I don’t eat chocolate, but I may try adapting them and making some sort of alternative base! Is there any way to use already prepared almond meal for the crust? What would the conversion be there if so? ?